This Indian Butter Chicken Recipe is an easy, make-at-home version of the restaurant classic. 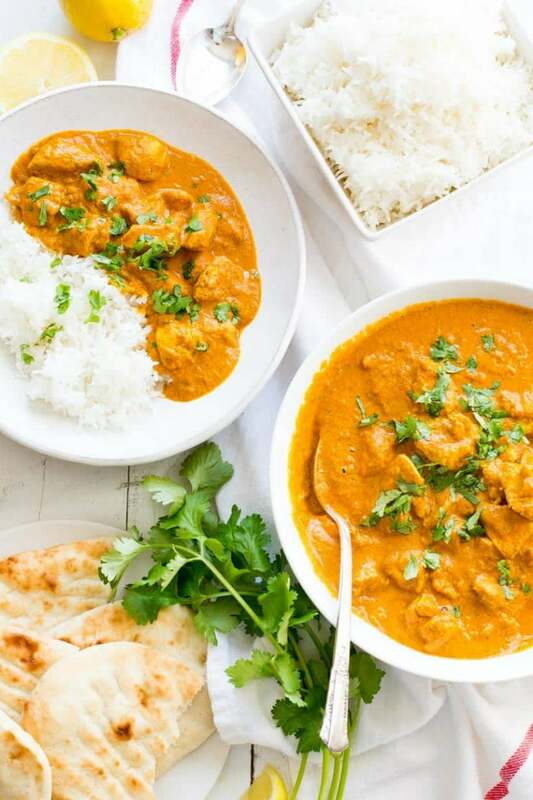 Indian Butter Chicken, also known as Chicken Makhani, is a classic, flavorful Indian dish. It was developed in the 1950’s by three partners who owned a restaurant in India. 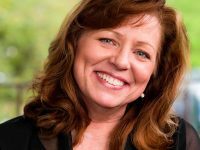 The dish was made “accidentally” when they combined leftover chicken with a tomato gravy that was rich in butter and cream. 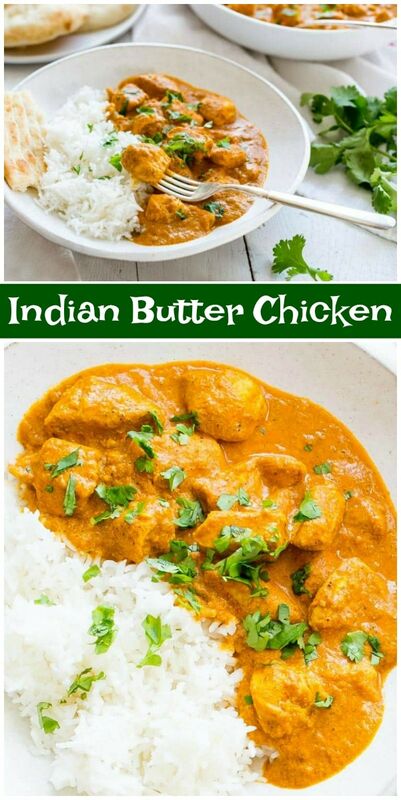 Indian Butter Chicken was born! Chicken is marinated for several hours in a yogurt and spice mixture. Then the chicken is cooked in a skillet with a spicy tomato sauce. You control the heat, so make it as spicy or as mild as you want. But I say bring on the heat! 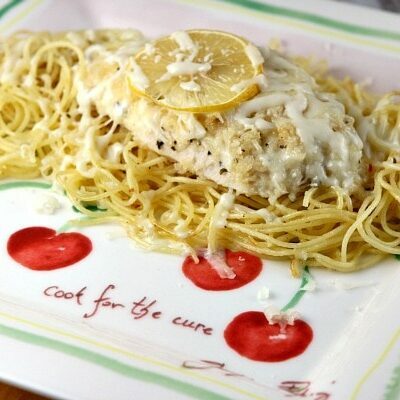 You can use boneless skinless chicken breasts or thighs in this dish, but for our table we prefer bite sized chunks of tender chicken breast. To lighten the dish a little, we have great success using half-and-half for the cream, but feel free to use full-fat cream if you prefer, or if you already have it on hand. 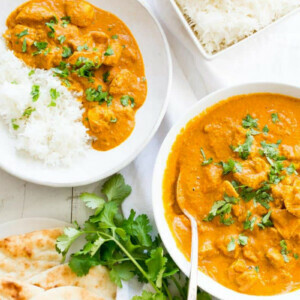 An Indian Butter Chicken recipe, Butter Chicken or Chicken Makhani can vary greatly from restaurant to restaurant, and region to region. 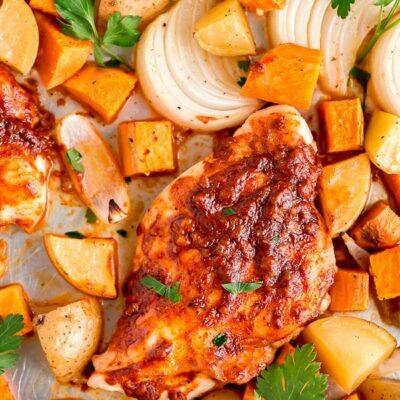 Some are made with whole bone-in chicken thighs, but most experts agree the original recipe may have been created to use up leftover restaurant tandoori chicken. Tandoori chicken is an Indian delicacy, made by marinating chicken in a yogurt and spice mixture, then roasting in a clay oven. Since we don’t have a cylindrical clay oven, we opted for an easy sautéed method featuring the same yogurt and spice marinated chicken. We’ve added a little chili powder to give our recipe a smoky flavor like tandoori chicken may have, and of course cayenne for heat. If you happen to have Indian chili powder, which is pure ground chilies with no additives, I would use it and skip the cayenne in this recipe. Indian chili powder is more like cayenne, in flavor and heat, than standard chili powder. 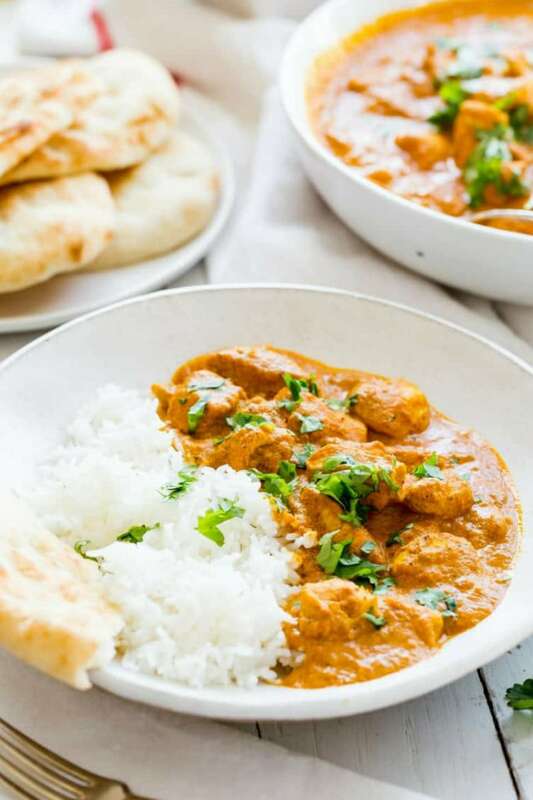 We love the flavor of this tomato infused curry sauce, which is very similar to the other super popular Indian dish – Chicken Tikka Masala. 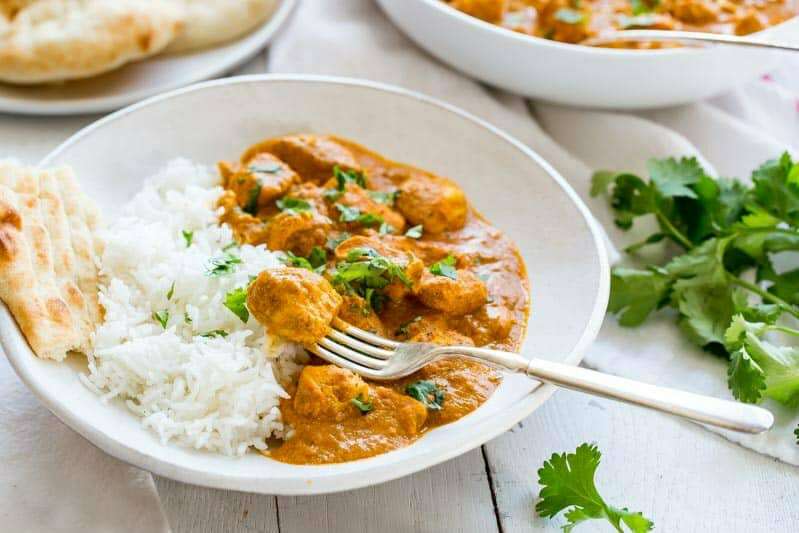 As you may know, Chicken Tikka Masala is a British creation, while Butter Chicken is a dish from the Punjabi region of India. 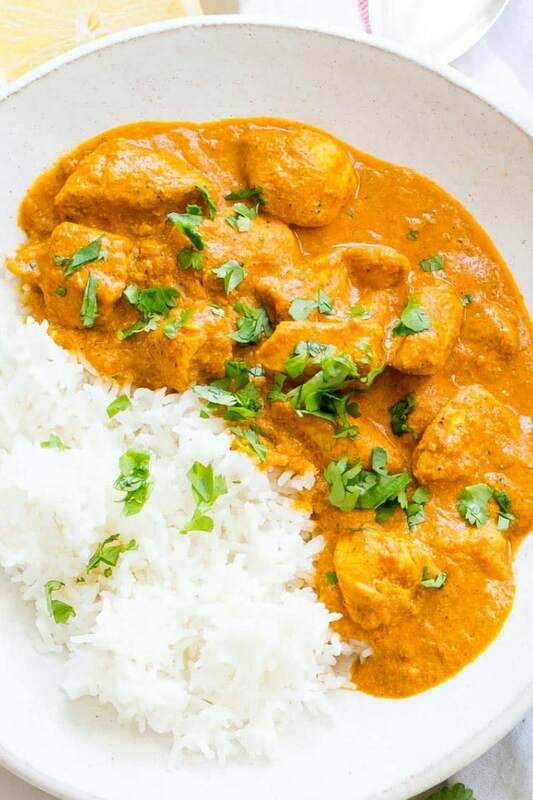 Butter Chicken tends to be less tomatoey and spicer than Chicken Tikka, and is often finished with a bit of butter melted into the sauce. Chicken Tikka Masala may be made with less cream too, but both recipes include garam masala, fresh ginger, garlic and plenty of rich spices. If you haven’t tried much in the way of Indian food, this is a good recipe to start with. 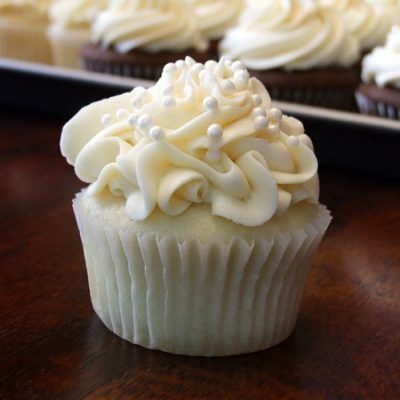 The flavors are incredible, and it’s really pretty easy to make. If you love tender chunks of marinated chicken, plenty of spice and a creamy hot sauce, then don’t miss this company worthy dish! 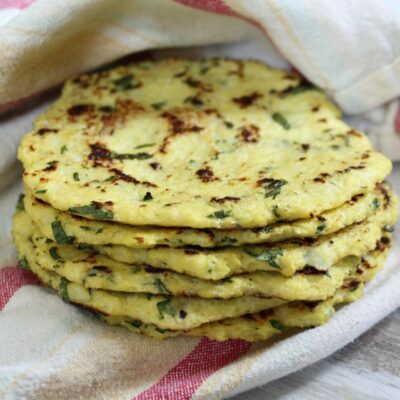 Serve with hot Basmati rice and Naan bread, and garnish with fresh cilantro for an incredible trip without leaving your kitchen! 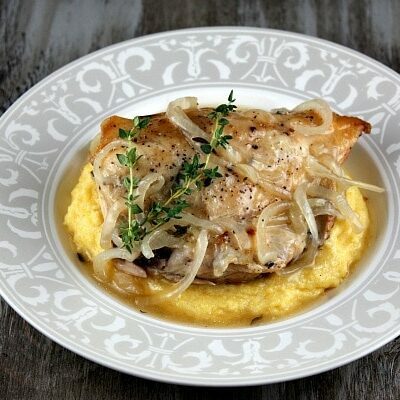 This chicken recipe is packed with great flavors! Combine all the marinade ingredients in a glass bowl. Toss to combine, cover and refrigerate up to 24 hours. Heat 1 tablespoon of butter and the vegetable oil in a large non-stick skillet over medium heat. Add the onion and sauté until softened, about 3 minutes. Add the garlic and ginger and cook, stirring constantly for about 1 minute or until fragrant. Add the garam masala, chili powder, cayenne and salt. Stir and cook until fragrant, about 30 seconds. Increase the heat to medium-high and add the marinated chicken pieces. Don’t worry about scraping out any remaining marinade mixture - just discard. Sauté until the chicken is no longer pink on the outside, about 5 minutes. Add the tomato sauce and tomato paste and simmer uncovered for 15 to 20 minutes, stirring occasionally until the chicken is cooked through. Reduce the heat, and add the half-and-half and remaining 2 tablespoons of butter, and warm gently until the butter is melted. Remove from the heat. Serve over hot rice and garnish with chopped cilantro if desired. Rice is not included in nutritional information. OMGoodness – yum! This recipe is so darned close it’s like we are eating at our favorite Indian restaurant. 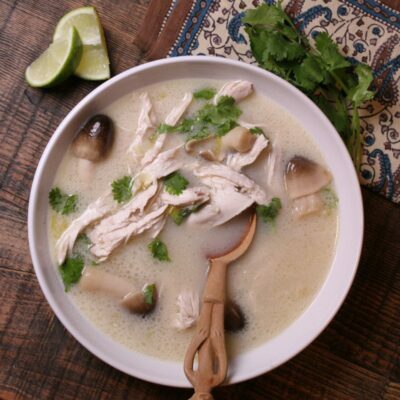 The chicken remains so moist – it really is simple once you get started. Out of this world! Going on my 2nd time making it tonight as it was requested by my 10yr old son. Every single one of my 4 kids ate this happily which is rare. A keeper for sure. Hubs is trying it tonight for 1st time so hoping I win him over now too. So I have tell you I only had limes so I subbed lime juice for lemon. I’m keeping it that way tonight even though I bought lemons planning ahead due to not wanting to jinx my luck with everyone liking it, lol. Limes….lemons…..both citric acid…. Right!? Have made this twice this week – made it for a dinner party, and the family wanted it again! This is our favorite Indian dish ever. So easy to make so SO yummy. Absolutely DELICIOUS! Such an easy recipe to follow. Thank you! Tricia knocked this one out of the park it’s delicious! This is a new favorite meal for weeknights in my house! Love this recipe! A real crowd pleaser! Whoa, this chicken was so tender and flavorful! The whole family loved it! This recipe looks tasty but I’m not seeing nutrition info. Frustrating as I’ll have to compile it myself should I choose to make this. Did I miss something? I’ve updated this information for you. 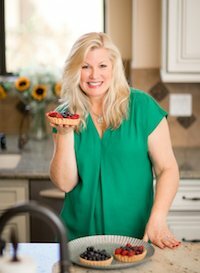 Adding nutritional info is a brand-new feature on my recipes, so I’m busy editing the old recipes to include it. Let me know if there are any others you need nutritional info for, and I’ll get on those right away!